Why we should not allow genetically modified crops in our country. GM crops and associated chemicals like herbicides are controversial world-wide due to their harmful effects on human, animal and environmental health. Our food and farming will be controlled by bio-tech multinationals and our farmer’s livelihoods will be adversely affected. GM crops will destroy bio-diversity and can even impact beneficial insects like bees and butterflies besides contaminating the wild gene pool. GM crops once permitted will contaminate regular varieties of crops as well, thereby leaving no choice for consumers if they want to avoid GM food, or farmers if they want to avoid GM seeds. Passing of alien genes from GM crops to other species through contamination is a very real and serious threat. 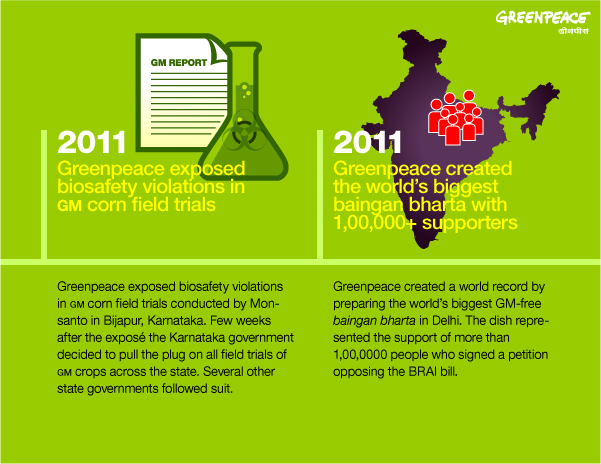 Corporate control of seeds through GM seed technology is an established reality. In the 10 years since Bt cotton was approved in India, Monsanto, through its patented Bt gene controls 95% of cotton seeds sold.